Uniquely handsome devotionals for St. Joseph: rosaries and chaplets created with inspired materials and exquisite care. 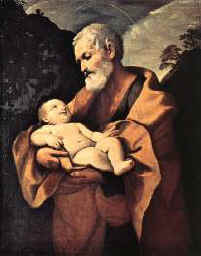 What emanates from the figure of Saint Joseph is faith... Joseph of Nazareth is a "just man" because he totally "lives by faith." He is holy because his faith is truly heroic. Sacred Scripture says little of him. It does not record even one word spoken by Joseph, the carpenter of Nazareth. And yet, even without words, he shows the depth of his faith, his greatness. We see how the word of the Living God penetrates deeply into the soul of that man, that just man. And we, do we know how to listen to the word of God? Do we know how to absorb it into the depths of our human personalities? Do we open our conscience in the presence of this word? See our catalog for available St. Joseph rosaries and chaplets. This handsome chaplet is one of a kind! At the center of this chaplet is a tender portrait of the Holy Family; this substantial 2" bronze medal was hand-cast from an antique. The prayer beads are 18mm cylinders of red tiger-iron, which has an iridescent quality. The meditation beads echo the shimmering mahogany reds, highlighted with olive/violet dichroic glass, layered over jet. A powerful, and yet ethereal, chaplet to hold! This powerful chaplet hints of St. Joseph's traditional color, purple --- swirling with whispers of white, gray, and earthy ochres --- with lepidolite, in 16mm faceted teardrops and 8mm rounds. A sterling 1.25" medal of St. Joseph completes the chaplet. This rosary interprets the traditional colors of St. Joseph with lustrous amethyst and foil lampwork beads, each sprinkled with a rainbow of color. The large 15mm sterling-capped Paters are handmade lampwork, swirling with ethereal shades of purple. The rosary is joined with a sterling centerpiece featuring the Holy Family, and completed with a handsome, substantial (2") sterling crucifix. One of a kind! (See the companion decima chaplet below). This decima interprets the traditional colors of St. Joseph with lustrous amethyst and foil lampwork beads, each sprinkled with a rainbow of color. The large 15mm sterling-capped Pater is handmade lampwork, swirling with ethereal shades of purple. The decima is completed with a sterling figural 1" medal of St. Joseph, holding the child Jesus and his staff of liliesl. One of a kind! The traditional Chaplet of St. Joseph contains 15 groups of 4, for the traditional 15 Mysteries of the Rosary. And now the Rosary has 20 Mysteries --- where does that leave St. Joseph's Chaplet? We offer two versions: a smaller version representing 5 Mysteries (in the same way a Rosary contains 5 of the 20 mysteries, to be said 4 times to complete all the Mysteries); and the traditional version, with 15 Mysteries. This rugged 15-mystery chaplet replaces the traditional colors with those suitable for a carpenter. It is made with 7mm maple-stained cubes of carved bone for the Aves, with 12mm mahogany seeds for the Paters, and a vintage bronze medal of St. Joseph. In the traditional colors of purple and white, this 15-mystery chaplet of St. Josephs uses 7mm amethyst rosebuds and 12mm alabaster 5-petal flowers, both in matte AB finish, for meditations on fifteen mysteries of the rosary. The chaplet is completed with richly-detailed figural medal of St. Joseph with the child, Jesus, in sterling silver. O Blessed Joseph, you gave your last breath in the loving embrace of Jesus and Mary. When the seal of death shall close my life, come with Jesus and Mary to aid me. Obtain for me this solace for that hour - to die with their holy arms around me. Jesus, Mary and Joseph, I commend my soul, living and dying, into your sacred arms. Amen.